Add a little friendly kitty to your breakfast, lunch or dinner with these unique pieces. Now you can have Hello Kitty when you have your breakfast, lunch and dinner. There are a number of different Hello Kitty place settings available that include a plate, bowl and a mug or glass. You can also get place mats and cutlery. 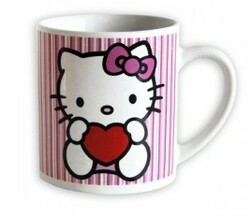 Perhaps you would like to have your morning coffee in a Hello Kitty mug then you are in luck. There is a large variety of designs available as well. Want a glass for your orange juice? Again, there is lots of different designs that you can choose. If you want to have a party you can also get Hello Kitty party supplies: plates, napkins and cups! The Hello Kitty design has become one of the most recognized designs in the world! You will find Hello Kitty on everything from coin purses to cell phone covers. Hello Kitty is a cartoon cat. She has no mouth and only small button eyes and nose and as well has the distinctive red bow over her left ear. Hello Kitty is the adorable feline that can be found on all sorts of different products including items for the table. This iconic figure has become appealing across the generations. Definitely this 30 something character has developed an almost cult-like following that seems to include everyone from toddlers to grandmas. According to Wikipedia, the Hello Kitty brand rose to greater prominence during the late 1990s. At that time, several celebrities, such as Mariah Carey, had adopted Hello Kitty as a fashion statement. Newer products featuring the character can be found in a large variety of American department stores. Followers of Hello Kitty probably bought her first product: the little vinyl coin purse. In fact, Hello Kitty has attracted older women to the brand who didn't discover her until they were young adults. It is these women who are paying several thousands of dollars for a Hello Kitty diamond-studded necklace or watch. There are even Hello Kitty wines produced in Italy than can be found in US markets. If you don't have enough of Hello Kitty you can now find Uggs, take out a Hello Kitty credit card or even play the Milton Bradley classic board game Twister. If you have around $3,000 to spend why not get the Hello Kitty Robot. How twenty first century! For the most fun meal or snack you can get, use a Zak! Hello Kitty mealtime set. The colorful plastic is strong and light, for kids of any age to enjoy a bite. What Do You Like About Hello Kitty? Whether it is a t-shirt, a handbag or bed sheets, Hello Kitty took the world by storm and made new friends everywhere. Chopsticks are fun to eat with adding a celebratory feel to any meal. plus chopsticks slow you down helping you to eat much less than normally, be conscious of what you eat now.